Which means ordering pad see euw in bulk from seamless is no. longer. fly. How about this: a well-balanced bowl of grains and veggies and protein that’s actually kind of good for you and tastes so fancy that you start to feel guilty about wearing jeans (or pajamas, or no pants at all… because really, we’re adults now and we aren’t afraid of a little buttcheek anymore). Nice restaurants could serve this and impress you. A nice restaurant probably wouldn’t serve this to you in your underwear. Know what else is cool? After dropping some money ($15) on the base ingredients, thereby securing you delicious repeat dinners for weeks, each serving size is like $4 out of your pocket. It also all comes together in less than an hour and I may or may not have eaten this like 6 times in the past three weeks. Remember the part where I said this tastes fancy?? Yeah, my mind is blown, too. most of this recipe is straight from smitten kitchen. Preheat oven to 400. Cook your rice however you like. Peel the sweet potato and cut into bite-sized cubes. 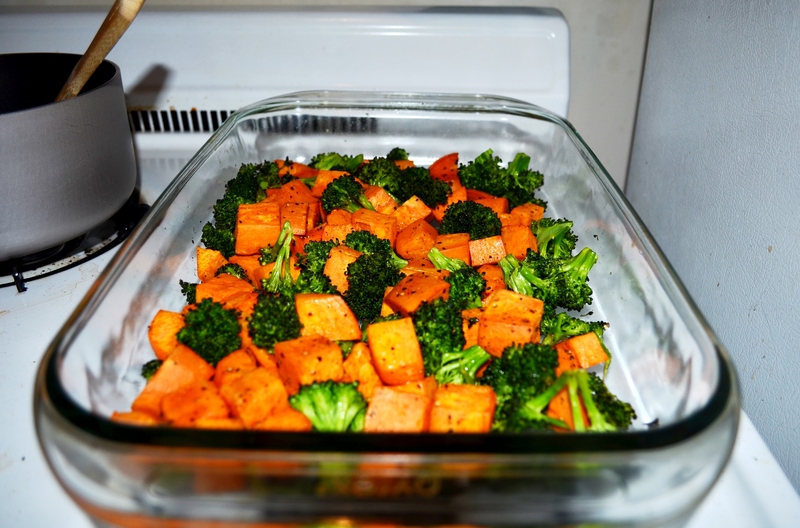 Toss with 1 tbsp olive oil and spread in a single layer in a baking pan (I use my 9×13″ pyrex). Sprinkle with salt and pepper (don’t go nuts with the salt), and roast for 20 minutes. While potato is roasting, cut the broccoli into bite-sized pieces as well. When 20 minutes are up, add to the sweet potato and toss with a little more olive oil. Roast for another 10-20 minutes, until everything is tender. 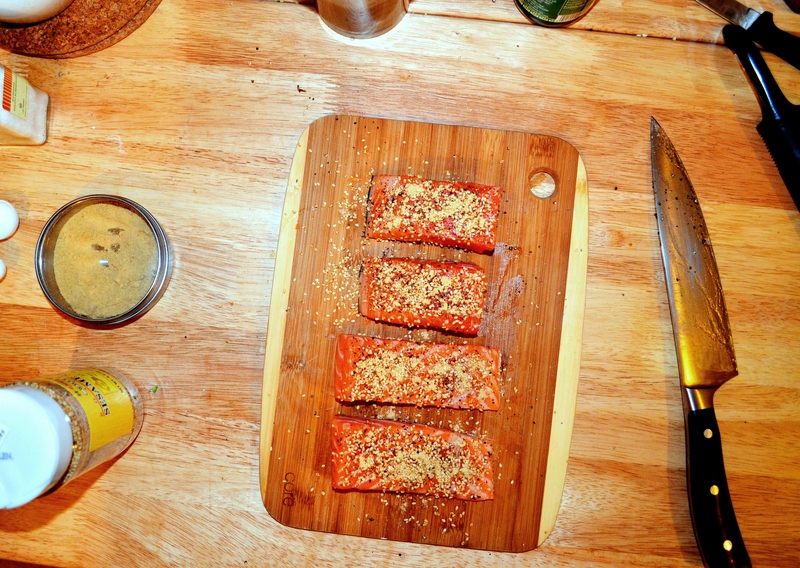 Prepare salmon fillets by seasoning with freshly ground pepper, ground ginger, and sesame seeds. Line a broiling pan with foil and place a well-greased wire rack on top. Lay fillets on the rack and stick under your broiler for about 10 minutes, flipping once if you want, until salmon is cooked through. While salmon is cooking (what a great multi-tasker you are! ), combine dressing ingredients and mix well. 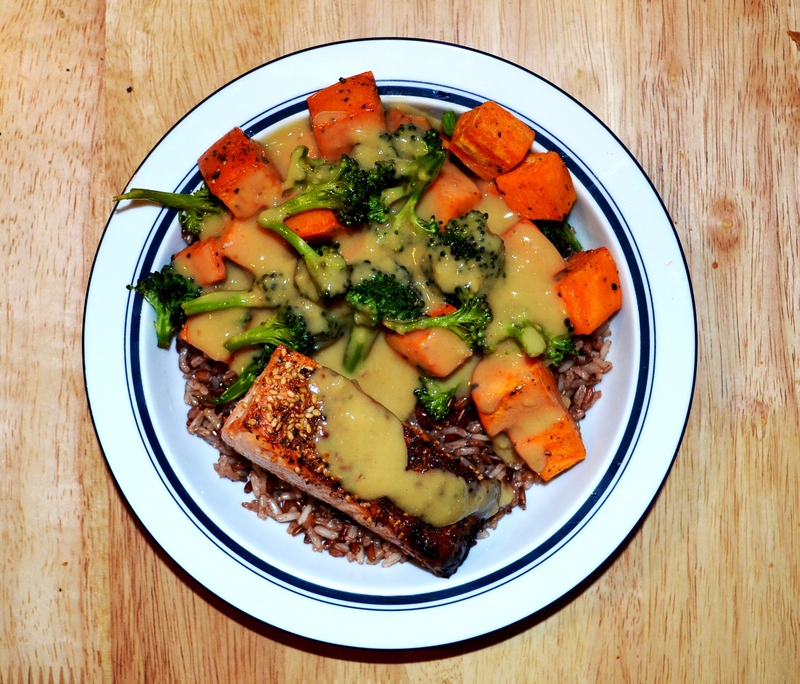 Serve bowls with rice topped with veggies and salmon, with a drizzle of dressing over the whole thing.